I’ve had a lot of people tell me they did everything they could to get rid of chipmunks and squirrels. My aunt, for instance, hated seeing squirrels climb up her bird feeder pole so she greased it. That didn’t stop the dang squirrels; they then started climbing the tree that overhung the feeder and leaped onto it. I thought she was going to say that she then cut the limbs of the tree, or the tree itself–but no. She glued pieces of broken glass to the top of the feeder. Now I know that would be frowned on today but this was back in the 60’s, and anyway, she died years ago so the feds can’t prosecute her. That brings me to the point of this post (of course you were waiting patiently). 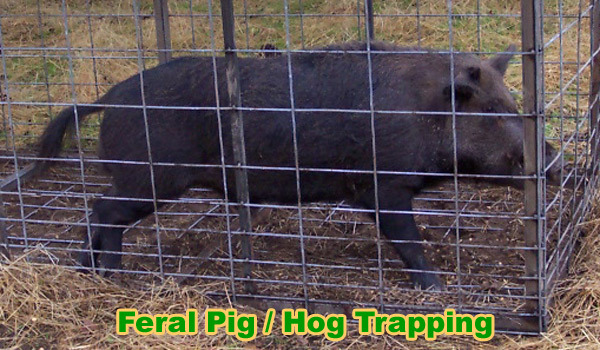 I recently heard about hunting feral pigs because they were taking over yards and fields and farms. The farmers actually made money by allowing hunters to fly over their land and blast away at all the wild pigs they could shoot. I also just came across a website for a company that does wild pig removal. It had a list of removal companies. Supposedly, there is actually a “right” trap for these critters, although they don’t tell how to build one. I guess they know you wouldn’t have a need to hire them then. The site says that once you capture one, “it is advised not to handle them.” I can buy into that. 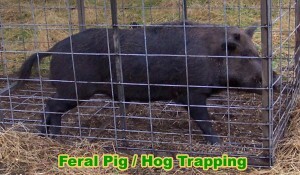 To keep wild pigs from coming into your yard, the article suggests letting your dog roam free. Personally, that doesn’t seem like the best idea if the hog in question has tusks. But , hey, it’s up to you. ps, let me know if you have wild pigs in your yard. I’ll email you the link. This entry was posted in Uncategorized on June 11, 2018 by siggersbee.